This custom build in South County upholds the owners’ priorities of family and clean living. Erin and Marc Sherman had talked about relocating their nest to Wakefield, but they weren’t actually in the market the day they serendipitously happened upon this property. “We were driving around and kind of dreaming — not really looking — and we came across a ‘for sale’ sign here,” she says. The one-plus acre property was bucolic: outbuildings, mature trees and rambling stone walls surrounded by a fourteen-acre parcel locked in land trust. The setting was private but it wasn’t isolated: The site was less than a mile from historic Main Street. “We made an offer on it that day,” she says. It was easy to be sold on the location, but the house was another matter. Sherman and her husband vacillated: Spruce it up or tear it down? When a happy surprise (baby number three was on the way!) meant time was suddenly at a premium, they brought in Alex and Rod Mitchell, brothers and co-owners of Meridian Design Build, on a recommendation from Sherman’s realtor sister-in-law. “We instantly liked them,” she says of the Mitchells. Although the Shermans originally viewed starting from scratch as the more daunting option, they reconsidered after further discussions with Meridian. Built in the ’60s, the house lacked a basement and it had some two-by-two construction — neither of which is ideal when planning a major remodel. Decision made: A new start was in order all the way around. Sherman is the owner of Mama Bird, an eco-friendly baby and lifestyle store and studio in Wakefield. Having a home that reflected her lifestyle was essential. 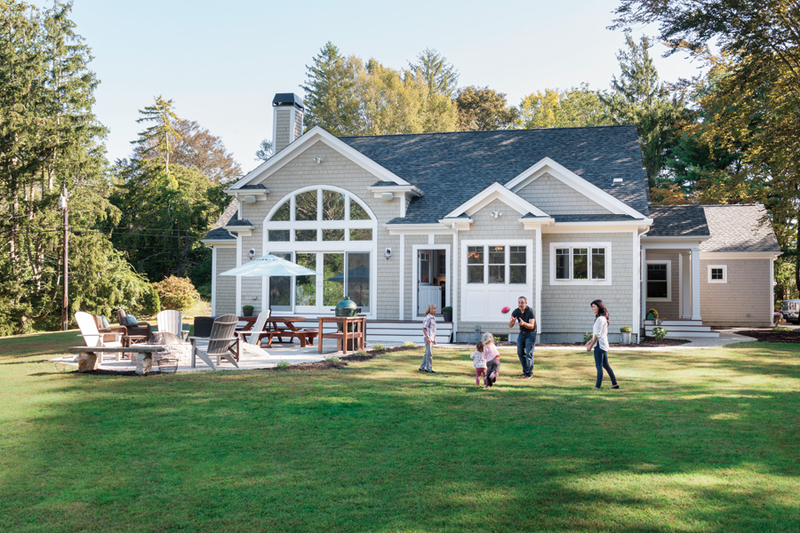 It had to be family-friendly (read: one level), spacious enough for their expanding troop, environmentally clean, outfitted with built-ins and it had to be in harmony with the rustic New England landscape. “Once we made the decision to rebuild, we knew what we wanted. We were very, very, very particular,” she says, even down to the exact positioning of the house on the property. The finished product was worth it. High ceilings and ample windows flood the sprawling kitchen with natural light. Between the built-in breakfast nook, island stools and an extended farmhouse dining table, seating in the kitchen is never a problem. VOC-free paint was used throughout the house, as was zero-toxic floor varnish. “We did everything we could to incorporate as few chemicals as possible,” Sherman says. Meridian custom home consultant Sue Andrade helped with the selection of tile and hardware finishes: subway tile in the kitchen, Bianco Carrera marble in the bathrooms and polished nickel all around. The hardwood flooring is another find that Sherman credits to Andrade. The couple liked the look of genuine barn board, but not the price tag. Andrade suggested rustic white oak, which has the knots and weathered appearance they wanted for about a third of the cost. The hardwoods unify the common areas, flowing from the front door, through the kitchen and into the living room, where an oversized custom fireplace — another special request — adds to the farmhouse flavor. “The whole living room looks like it’s open to the outside, and the property is what sold us in the first place,” says Sherman.